What’s your top 10 moments in 2010? Before you set new resolutions for 2011, it is always wonderful to reflect on the year and celebrate every wonderful moments so that we can grow from strength to strength. On 29 April, Sony Pictures and my company (Table For Six) jointly organized the Back up Plan Movie and Dinner event. Our company conducted a survey on Singapore’ ladies’ backup plans should they remain single for the rest of their lives. The results were insightful and the press/media given us a lot of coverage. 8. Advanced Certificate in Training and Assessment – Certification. From 9 Apr till 15 June, I took 6 modules, get through the assessments under Singapore National Employers Federation (SNEF). With this Advanced Certificate, I am able to Develop, Train and Assess courses under WSQ framework from WDA. 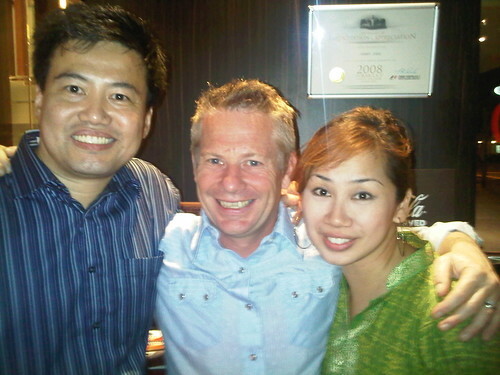 Many people would have heard of Dating@Sea since 2007 where it is only open to singles from Singapore. It was all along done with Star Cruises as our cruise partner. Finally from 6-10 Dec, the 1st ever Singapore-Malaysia social event (Single Cruise Asia), a 5D/4N cruise on Royal Caribbean’s Legend of the Seas was organised. It’s not everyday you get to be interviewed by a host from a international media, much more a international celebrity host – Ian Wright. He was in Singapore in May to do a special 10-part episode on Singapore. At the very last part, there is always the angle of singlehood issue in Singapore. I was contacted to create a social event where his team can film the entire event with interviews about myself and some of my participants. I had always wanted to do my bid for charity in forging strategic alliance between charities and business entities. 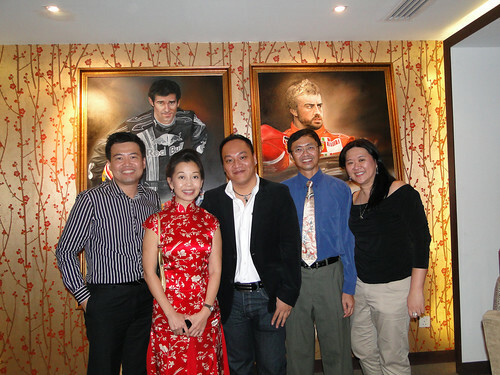 I am glad in 2010 I have helped my good friend Ocean Wang to launch her career by painting 3 portraits of F1 drivers : Lewis Hamilton, Fernando Alonso and Mark Webber. The Alonso portrait was successful auctioned silently for $4000 in the charity dinner of Lutheran Community Care Services (LCCS) with the kind planning and organising service of Annie Chan. Walking with Dinosaurs is the most successful and money-making family entertainment theatrical production in the world. For the first time ever, it came to Singapore from 1-12 Dec for a 10-day 20-show performance. My company won the tender to manage the social media marketing platform. One of my deliverables was to raise social brand ambassadors. I was given 200 tickets for the very first show and I invited charities and brand ambassadors to be the first few people to watch it. The turnout was 4000 so I had 5% of the stadium on 1 Dec. Since receiving the Spirit of Enterprise award as an honoure in 2008, this is the 2nd business award I have received in the space of 3 years.